Telling the story of your business is about more than writing grammatically correct proposals and emails or speaking to investors without using "ums" and "uhs." To get your message across, you have to fi nd a dynamic way to reach your vast audience of stakeholders, consumers, and competitors. 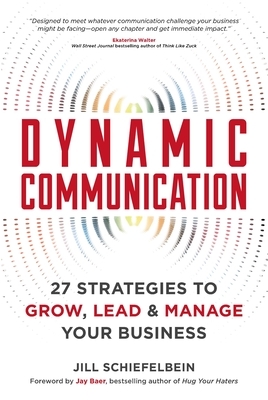 Business communication expert Jill Schiefelbein shows you how, delivering an education on how to build a communication-savvy business that retains employees, secures investors, and increases your bottom line. So grab a highlighter, get a pen, or sharpen a pencil and start crafting your communication strategy today. Jill Schiefelbein is a former professor, professional speaker, and business communication expert. Her business, The Dynamic Communicator, helps companies solve problems, retain talent, and produce revenue. From analyzing documents obtained from military raids of terrorist camps to building an online education office serving more than 60,000 students, Schiefelbein loves a strategic challenge.